In December 2015, Detroit was named to the UNESCO Creative Cities Network as a City of Design. It is the first and only American city to be designated as a City of Design. This is kind of a big deal. Detroit's diverse collection of 19th- and 20th-century skyscrapers, century-old industrial buildings, and historic private residences certainly played a role in that. Detroit has an inventory of architectural marvels from some of the most significant names of the past two centuries: Albert Kahn, Ludwig Mies van der Rohe, Minoru Yamasaki, Daniel Burnham, Frank Lloyd Wright. Yamasaki used his One Woodward design as a template for the World Trade Center's Twin Towers. Mies van der Rohe envisioned the country's first urban renewal project, designed to keep the middle class living in the city, in the idyllic Lafayette Park. Albert Kahn, known as "the architect of Detroit," produced more buildings than any other architect in his lifetime. Detroit also has dramatic Gothic churches and beautifully landscaped centuries-old cemeteries, picturesque historic neighborhoods filled with 19th-century Victorian mansions and mid-[20th]century modern townhouses, and a remarkable collection of public art that spans from massive metal sculptures ("The Spirit of Detroit," the Joe Louis "Fist," "Transcending" in Hart Plaza) to artist-led mural projects, and ever-evolving installation projects encompassing whole city blocks. It's not easy to highlight just seven of Detroit's manmade wonders, but these stand out even among the exceptional. While Frederick Law Olmsted’s connection to Belle Isle tends to steal the limelight (he designed a few of the features, including the canals), the Anna Scripps Whitcomb Conservatory, designed by Albert Kahn, is an architectural marvel in its own right; inside is a veritable paradise offering tropical respite from Michigan's typically harsh winters in five distinct greenhouse sections. 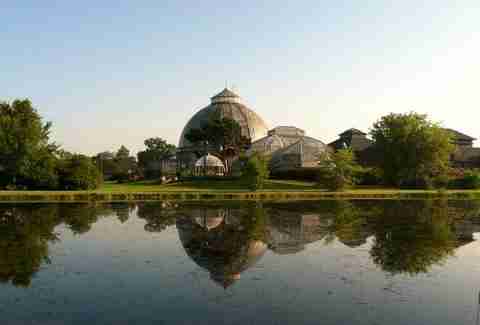 The 985-acre park also has the James Scott Memorial Fountain, Belle Isle Casino, Nature Zoo, Dossin Great Lakes Museum, Detroit Yacht Club, Athletic Field and Field House, natural forests and wetlands, the only public beach in the city, and the not-so-secret "hipster beach." The Beaux Arts, Kahn-designed Belle Isle Aquarium, which shuttered in 2005 when it was still the oldest continuously operating aquarium in North America, officially reopened this summer on Fridays and Saturdays. During the darkest days of Detroit's record-setting bankruptcy, it seemed as if the DIA's near-priceless collection was on the line. A 2014 appraisal of the museum's 65,000-or-so-piece collection valued it around $8.1 billion -- showing that while not quite "priceless," it is certainly quite valuable. Thankfully the collection was saved from the auction block, and Detroit retains one of the largest, most significant, and most expansive art collections in the country. The anchor institution of Midtown's Cultural Center Historic District was built in 1927 and was designed in the Beaux-Arts neoclassical Italian Renaissance style by Paul Philippe Cret. 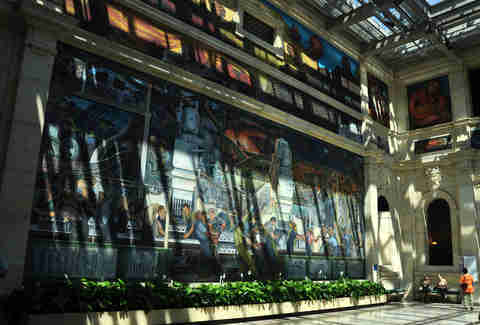 It covers 658,000sqft with over 100 galleries, and includes among its many, many assets a set of five massive murals by Diego Rivera collectively titled "Detroit Industry," or "Man and Machine," as well as the C. Howard Crane-designed Detroit Film Theatre. It is also one of the most-visited museums in the world. Located in what was once called the Cass Corridor, the 14-story neo-Gothic Masonic Temple is the largest Masonic Temple in the world, and is still home to many of Detroit's Masonic organizations. But that's not all it's home to -- since 2011, the Masonic Temple has been home to the elaborate annual Halloween fete, Theatre Bizarre, billing itself as "The Greatest Masquerade on Earth" and legitimately considered to be among the best costumed Halloween celebrations in the country. The labyrinthine 1926 building is an ideal location for the event, which features elaborate set pieces that evoke turn-of-the-century carnival freak shows and more than a bit of Masonic mysticism. The Temple made headlines in 2013 when erstwhile Detroiter Jack White saved it from tax foreclosure, earning his name on the Cathedral Theater (now the Jack White Theater). It is also the end point of the annual Marche du Nain Rouge, the uniquely Detroit parade of revelers who march to drive the devilish red dwarf from Detroit every spring. 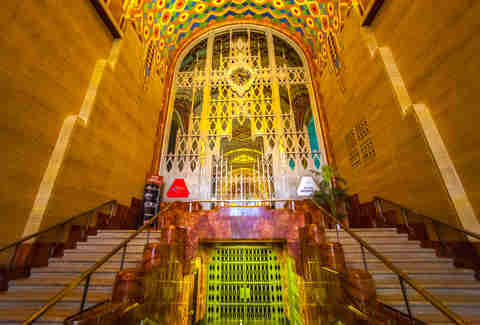 Of all the early-20th-century skyscrapers still standing in Detroit, the 40-story Guardian Building is the (near) universal favorite. The building itself, a National Historic Landmark also known as the "Cathedral of Finance," is all the attraction you need -- the Art Deco-meets-Mayan Revival style features orange brickwork with tile, limestone, and terra cotta on the exterior, while the interior is a multi-color mosaic of Pewabic and Rookwood tile with Native American themes that, honestly, feel a little better suited for the Southwest than the Midwest, making the Guardian all the more distinct from the other skyscrapers of its time. Stone carvings by Corrado Parducci depicting the allegorical figures of "Safety" and "Security" flank the Griswold St. entrance of the building. 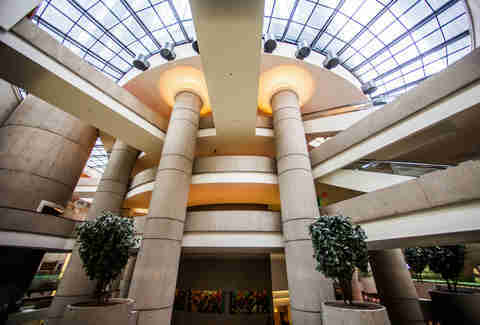 The three-story lobby is decked out in several different kinds of rare marbles imported from Italy, Belgium, and Africa. Designer Wirt C. Rowland, who also designed the Buhl and Penobscot Buildings, was superbly obsessive to detail, which is documented in equally superbly obsessive detail at Historic Detroit. 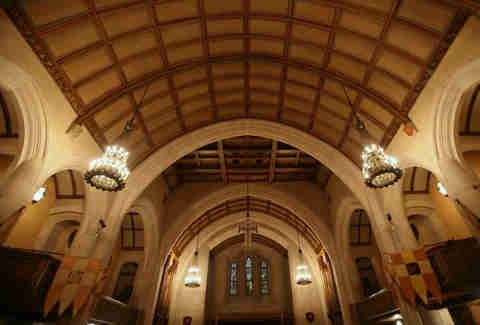 The building is also home to one of Pure Detroit’s popular architectural tours on weekends (schedules posted here). The Rowland Café might not have the best coffee in the city, but it is certainly one of the best spaces to enjoy a cup, situated as it is beneath the arched mezzanine of the impressive building. 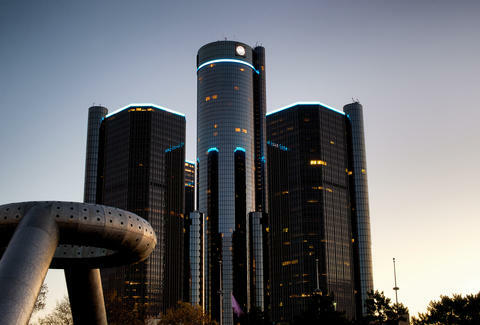 If you find the layout of the GM Renaissance Center daunting, blame postmodernism. Or, more accurately, blame the aesthetic populism of the time that dictated a need for those forced to go to the city to not have to actually engage with the city in any way. If you've ever wondered why the RenCen feels like an insular fortress, this is why, and yes, it was intentional. The cluster of seven interconnected skyscrapers is so large it has its own zip code, and the central tower was once the tallest all-hotel skyscraper with the highest restaurant in the western hemisphere (those records have since been bested, but it's still really damn tall). Renovations over the last decade have opened up the RenCen to the public more, which include the five-story glass-enclosed Wintergarden atrium that overlooks the Detroit River and opens out onto the GM Plaza & Promenade and Detroit Riverwalk, a public amenity that is itself one of the best ideas city leadership has ever had (not listed here because here are a lot of urban riverwalks in the country, and most of them are also quite nice). Even so, the RenCen is still more impressive from the outside than the inside, but we can't possibly imagine Detroit's skyline without it. Large-scale historic preservation and adaptive reuse projects are not new, nor are they unique to Detroit. While many such projects throughout North America are born out of the collapsed shipping industry, Detroit's automotive history saw the construction of massive industrial buildings, millions of square feet in size, constructed in the first quarter of the 20th century that are now getting a new life. 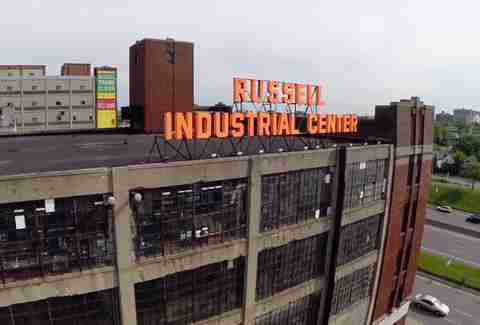 Most of these were built by Albert Kahn Associates, including the infamous Packard Plant (currently undergoing a reno/demo of its own) and the 100-year-old Russell Industrial Center. The seven-building RIC complex encompasses 2.2 million square feet, and more than one million square feet has been renovated as studio spaces. The Arts Building is home to over 140 artist studios, making it the largest arts hub in the Midwest, and there is also an exhibition center, where big-budget movies like the highly-anticipated Batman v Superman: Dawn of Justice have filmed. This is certainly the outlier of this list. It's not a striking skyscraper or a sprawling arts destination -- well, actually, it is a sprawling arts destination, just of the literary kind. The 1905 building was originally designed as a factory for a dry goods wholesale business, but has been home to John K. King Used & Rare Books since 1984. 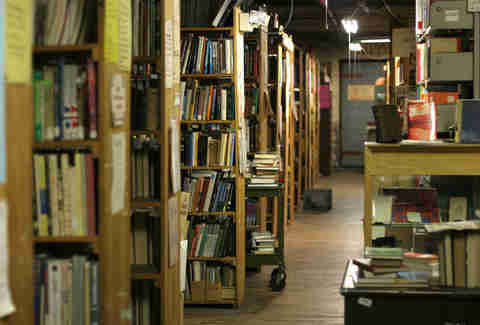 The store carries over one million titles, stuffed wall-to-wall with used and rare books, and has been highlighted in national media, including Salon and Business Insider, as one of the best bookstores in the world. The dilapidated exterior and the roughshod surroundings conceal what is one of the most impressive and expansive retail book collections in the country, and is truly one of Detroit's cultural gems. Nicole Rupersburg is a freelance travel and culture writer who moved to Las Vegas over two years ago, during which time she has gained a whole new appreciation for Detroit’s obsession with architectural name-dropping.